In four days, I join forces with seven other regional artists in the group exhibition, Elements of Style: Color, Line & Texture. It all happens Thursday, July 12, 2018 from 6-9pm, coinciding with the special “Summer Spectacular” Thursday night Scottsdale Art Walk in Old Town Scottsdale. 7077 E. Main Street, Suite 6, Scottsdale, AZ. The exhibition will remain on view through Saturday, August 25, 2018. “This exhibition showcases the work of eight noteworthy artists based in both Arizona and Texas including Angel Cabrales, Charmagne Coe, ColorOrgy, David Allan Paul, Dan Pederson, James Anthony Peters, Daniel Shepherd, and Marilyn Szabo. Their work is original, captivating, pushing boundaries and redefining their mediums in contemporary art today. The evening will feature an opportunity to meet the featured artists, lively art discussion, as well as light hors d’oeuvres and refreshments,” states Nicole Royse, owner and curator at Royse Contemporary. More information: roysecontemporary.com and https://m.facebook.com/events/1413397598760660#!/events/1413397598760660. We hope to see you there! In Elements of Style, I will be featuring my latest painting, full of hope and humor, Flesh the Meadow. It is approximately 31″ x 39″framed. Here also are some of my most recent works. I continue to travel the side roads in my process. Incorporating new media – like feathers (the one below is yet another found gift from my son! ), scraps of fabric, wood and string – is a playful investigation, and very spontaneous. 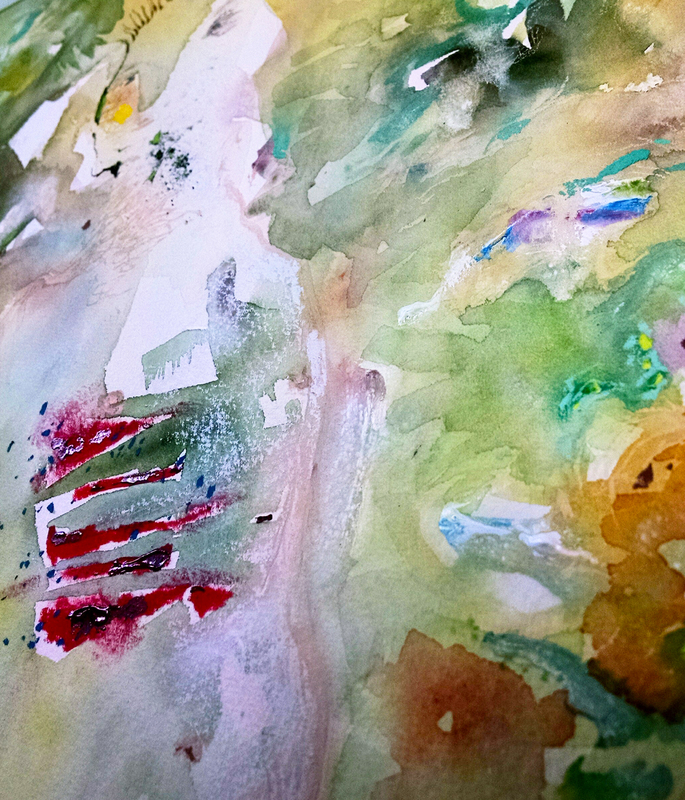 These elements add literal and metaphorical dimension to my painted narratives. 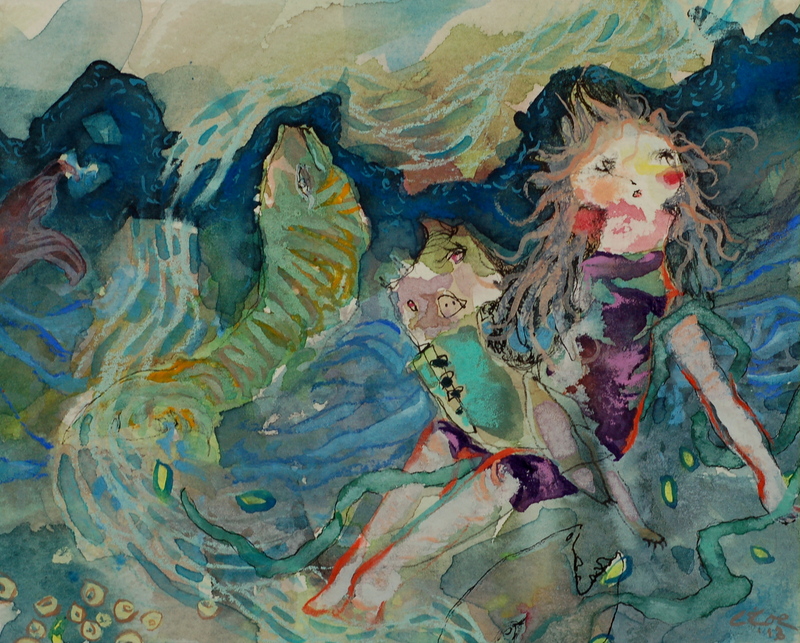 This joyful work is Feral the Foxes, 2018 watercolor, ink, pastel, acrylic, charcoal and found feather, 27” x 21″, unframed. This is another painting in which I’ve subtly gravitated in a newer direction and have collaged pieces and used acrylic for added texture. 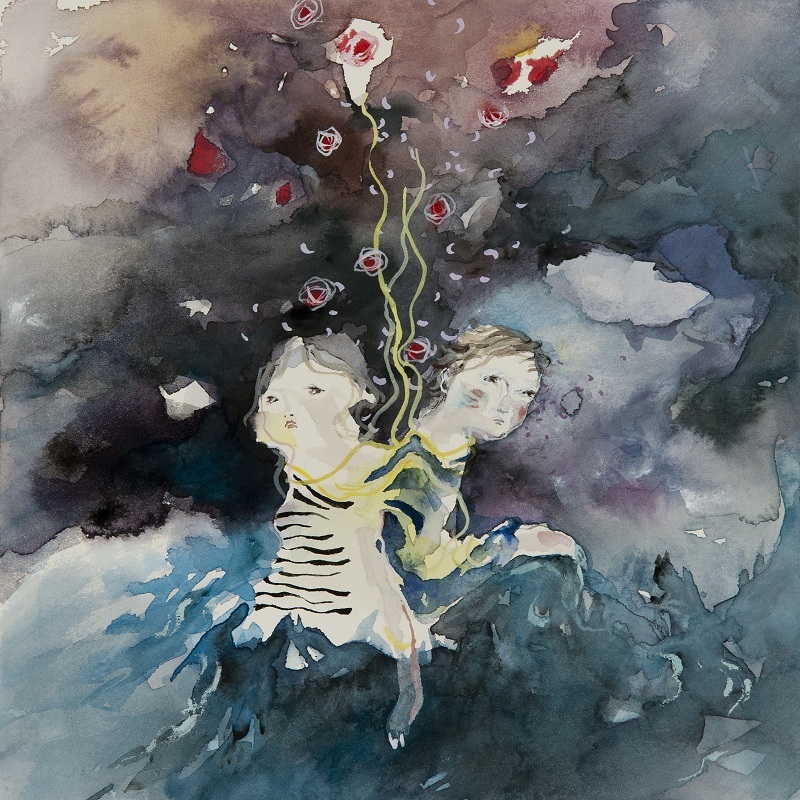 Well Spirit, Well-Spun, 2018, 12 1/4″ x 9″, watercolor, ink, pastel and acrylic. 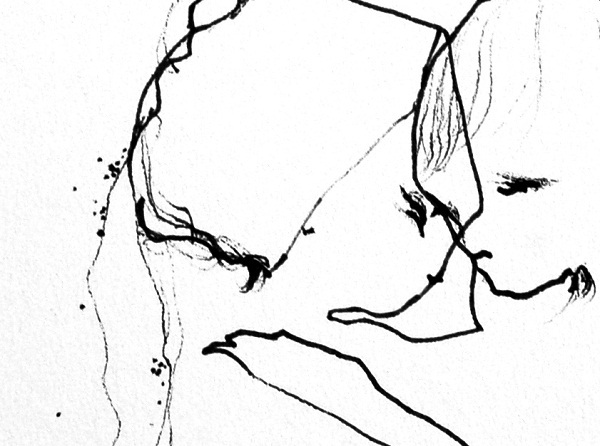 And… one of my favorite figurative drawings so far this year. Hear Tell, 2018, pastel and ink on cotton paper. Thank you for reading! Have a great July! I have recently finished the new painting, Treasures, watercolor, ink and pastel, 9″ x 13 5/16″. This magical little painting can be also seen at my website, charmagnecoe.com. Limited edition giclée prints are available. Each is based on an original painting I created in watercolor, ink and pastel. I like to create small volumes to preserve the value of each one. 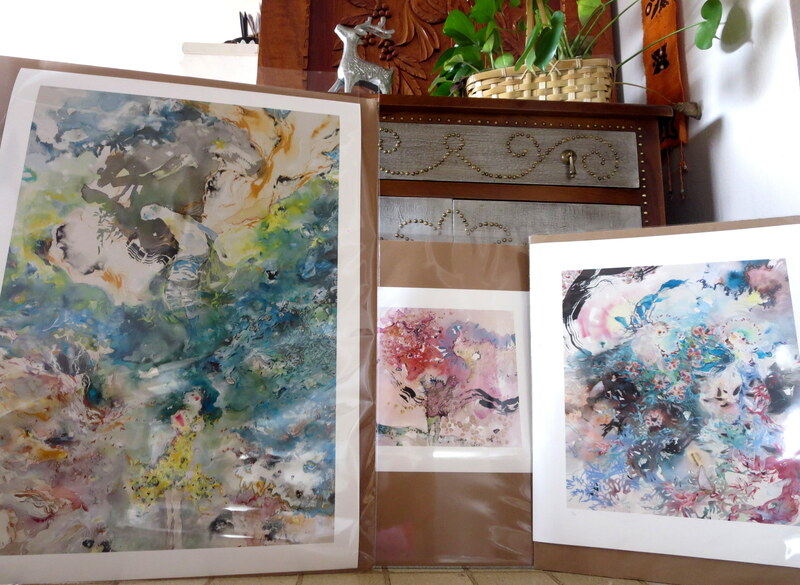 They are professionally printed on 255 gsm acid free, 100% cotton rag Somerset Velvet paper (similar look and feel to watercolor paper) using Epson’s archival UltraChrome pigment inks. Each print is signed and numbered on the front. You can view them here! Original paintings, such as the above When the Lines Disappear, I Am Not Afraid With You are seen at my website as well. Earlier this year, I was honored as Art and Art Deadline’s February Featured Artist. I thoroughly enjoyed participating in the interview conducted by its talented creator, Rachel Gibson. At this site you can read about artists who are pushing the boundaries of contemporary art. It is also an invaluable resource for artists looking for reputable opportunities for publication and exhibition. If you enjoy my work and feel so inclined after reading my interview, please leave a comment. Artists who receive the most comments by December 31st will be awarded AAD’s Featured Artist of 2014. Thank you! I’ve been listening a lot to Damien Rice’s new album, My Favorite Faded Fantasy. Damien’s voice and words slice, like velvet and talons, to the bone of it all. I dare you to listen without tears. If you’ve loved and hoped, you know. Here is “I Don’t Want to Change You”. I completed this painting in 2012, but am now releasing it. It is “Wending Bleeds and Buildings”. 8″ x 9 3/16″, watercolor, ink and pastel. I am also submitting this for Illustration Friday‘s weekly theme “Urban”. You can also see this at my website. 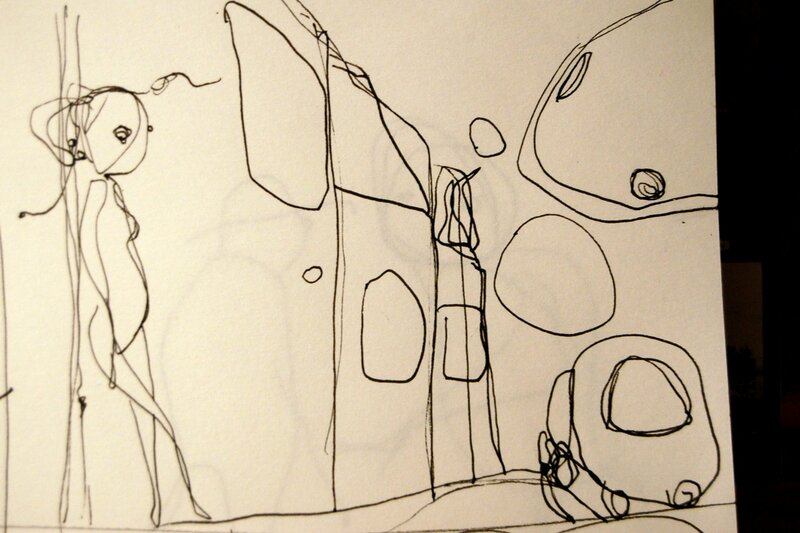 Been sifting again through old drawings, lots of them raw, unfinished and primitive. I reiterated one of those ideas on Saturday with pencil. This is “Morocco” by Susanne Sundfor. Woolen is my ink drawing submission to Illustration Friday‘s theme, “wool”. Here is another. 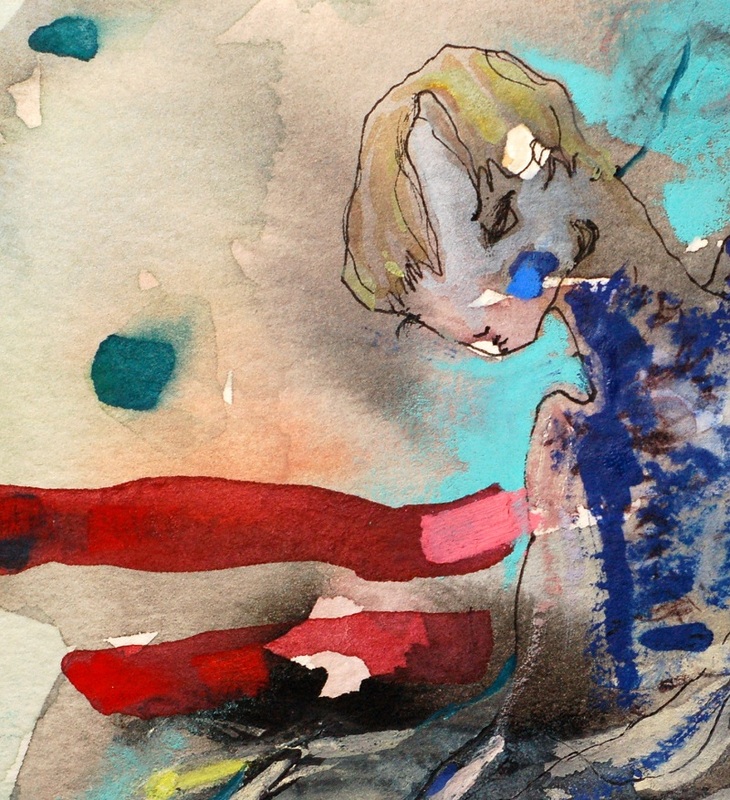 This is a very small painting, While Swimming. I painted it on a cold, snowy day and imagined being in a much warmer place, by the ocean, in the ocean. About the pig, well, that’s another story. I have been delighted and moved by a new musical artist from Iceland, Mikaali Karlsson. His work is reminiscent of some other Icelandic musicians, but his voice is his own. He found me at Twitter and I immediately jumped onto Spotify to give a listen. His website is here. The Summit is his latest EP. This song is “Súlur”. Go on. Check it out. I was delighted when Philippe Debongnie invited me to submit an artwork for his project, Jazz and Draw. Each participating artist selects a jazz song and then creates an original, visual interpretation which are featured at his website. My contribution is the painting, “Vessel”. It is in response to “Body and Soul” sung by Billie Holiday. Here is Lady Day in 1945. And another at the L.A. Philharmonic Auditorium in 1945. 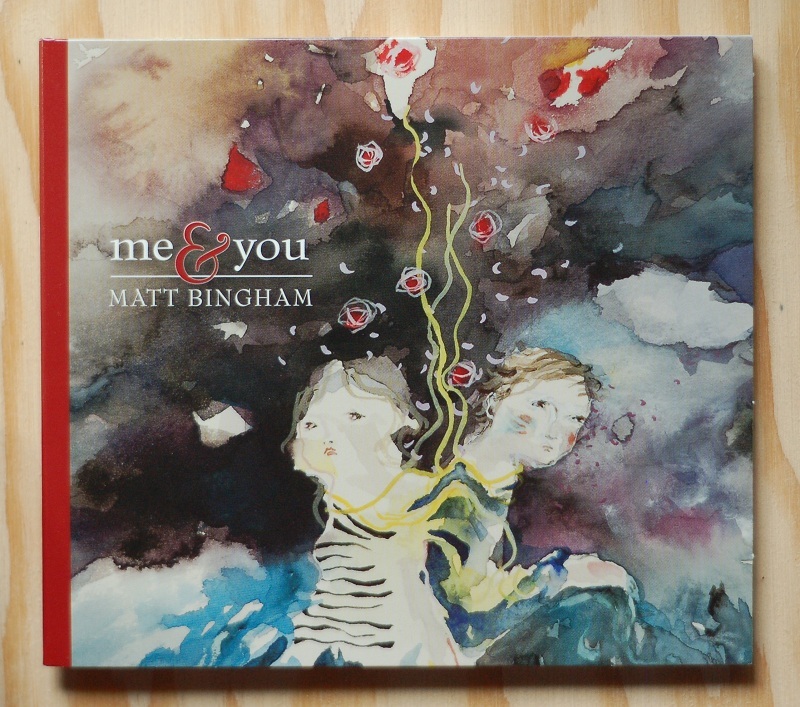 This week, Matt Bingham, a singer/songwriter from Arizona, released his new CD. It is titled Me & You. I am delighted to have created the cover artwork, a painting titled “The Heart Immersed and Threading Currents”. Bingham‘s music pulls at the heartstrings with his earthy voice and smitten lyrics. Do yourself a favor and pick it up here. This is a very small painting I finished a few days ago. 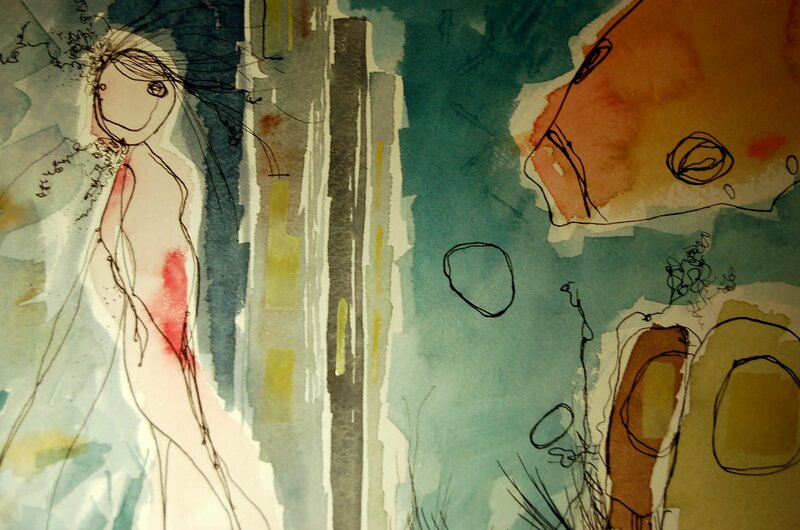 “Messenger”, 4 1/4″ x 4″, watercolor, ink and pastel. A sienna ink drawing titled, “Press Down”. The Illustration Friday topic for this week is “Identical”. Here’s my entry, “Carbon”. Created in ink and pastel. The wheels are turning. Have several projects going at once… which is how I like to rock and roll. Recently finished: “From Hinterland”, watercolor, ink and pastel, 7 7/8″ x 9 1/16″. It is a smaller painting. It is also viewable at http://charmagnecoe.com. 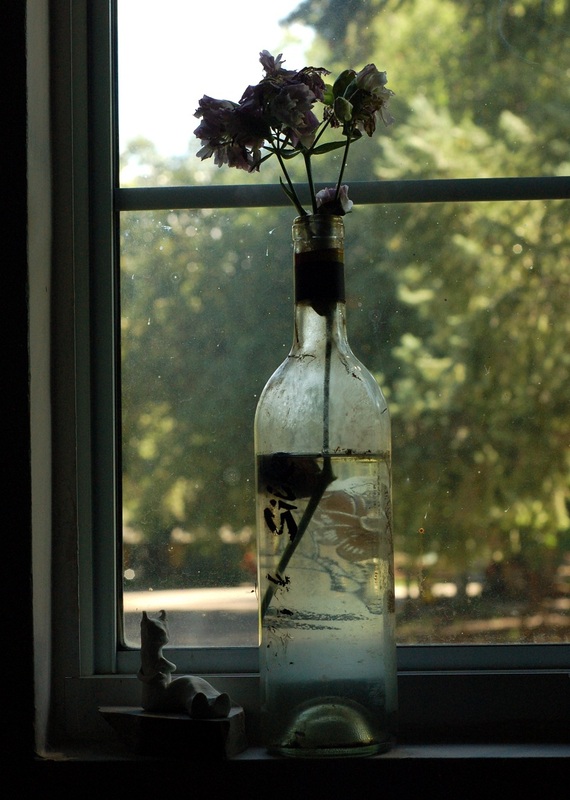 My son picked flowers and placed them in an old wine bottle for me. A treasure! I’ve long been a fan of Ulrich Schnauss’ music. This is “Goodbye”. “Cords” is my entry for this week’s Illustration Friday theme, “Suspend”. It was inked and painted on drawing paper. Here is a little drawing, a continuation of an earlier idea. “Nibble 2”. Here is another nibble from the past. Goodbye. I wish you well. My studio is messier than it’s ever been – it’s because I have been hopping from project to project. I’m sort of swimming in post-its, watercolor testing strips and various paintings stacked here and there. It’s fun to be involved in several things at one time. Amidst it all, there is always time for drawing. Here is my submission for Illustration Friday’s theme: Heights. My thoughts on this… I believe hope is a precious thing. It reaches above us even while we are confused or pushed down. The poignant Illustration Friday theme this week is “Return”. There is always a place we feel home, we feel safe, to where we want to return. Perhaps when we leave the womb, it is the first and most deeply imbedded impression given to us by nature. We need each other, even as we leave and go out on our own for a while. We return to our kin and to love. 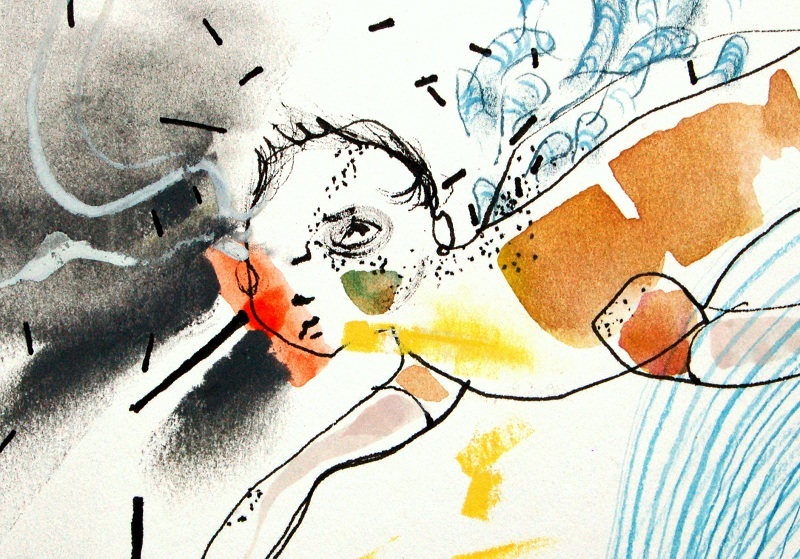 The above ink drawing is titled “Returning”. Another drawing from this week. This song kept coming to me while pondering IF’s theme.